Welcome to the weekly newsletter from The Edge Group. For each edition, we pull together our favorite content on all things media, marketing, innovation, analytics and of course, email. If you’d like to learn more about the work we do, or discuss anything related to newsletters, content and data, please get in touch here. 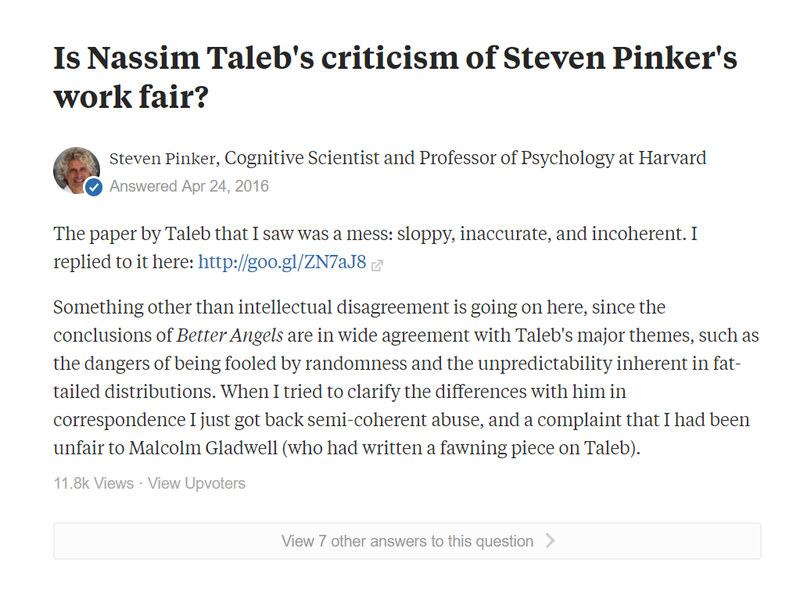 Quora remains a platform that divides our office — it’s either the single best online destination for gathering around knowledge, or an odd 2013 internet time capsule that’s one step away from Yahoo Answers. Relevant to readers of this newsletter, Quora now has conversion-optimization in it’s ad campaigns. If anyone has had success advertising on the platform, we’d love to hear from you (we’ve tested, but never really invested). Fighting the Mafia with A.I. These days, even technology-driven, crime-fighting firms steeped in academia have cool, agency-sounding names like Crime&tech. Our favorite piece this week covering the logical and incredible possibilities of A.I. comes from The Economist. Using the data of 5,000 firms directly linked to the Mafia, an Italian data firm is working to algorithmically predict the likelihood that a firm is paying off the Mafia using payroll data, income patterns, and even demographic data. A new Wharton research paper, “p-Hacking and False Discovery in A/B Testing”, looks at the sometimes problematic A/B testing shortcut taken by marketers. Is the Museum of Ice Cream a “braindead, Instagram-optimized fun house” or a future vision of physical retail? A Bloomberg piece that brings us back to when HBR coined “experience economy” in the late ’90s, citing examples along the lines of Chuck E. Cheese: “now, in the time-starved 1990s, parents neither make the birthday cake nor even throw the party… they spend $100… to ‘outsource’ the entire event”. Fast forward to 2018, and the experience economy manifests itself in the form of the loved and hated “Instagram museums”. Places like Rosé Mansion and Dream Machine are pre-built selfie factories, and are ultra-profitable. 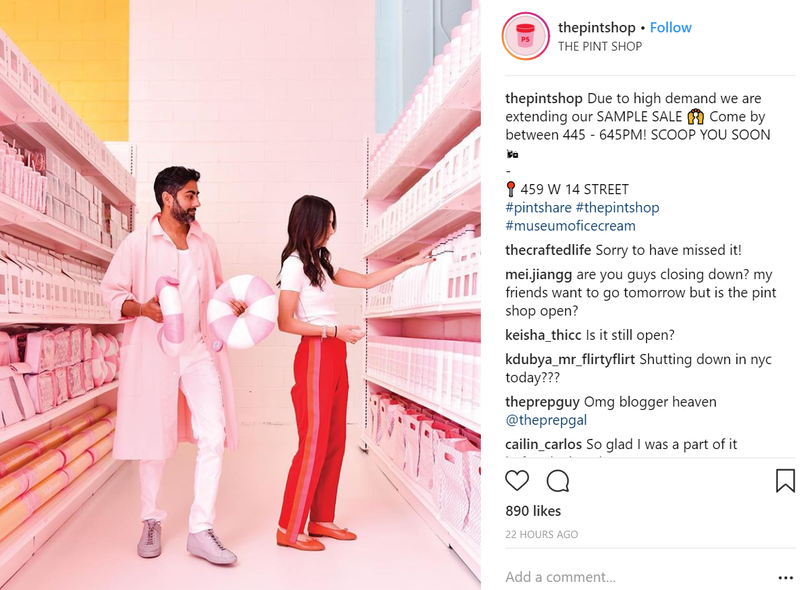 The Pint Shop is a retail spinoff of the ultra-successful Museum of Ice Cream, and offers a glimpse of how retail in the future might create stories around its products. 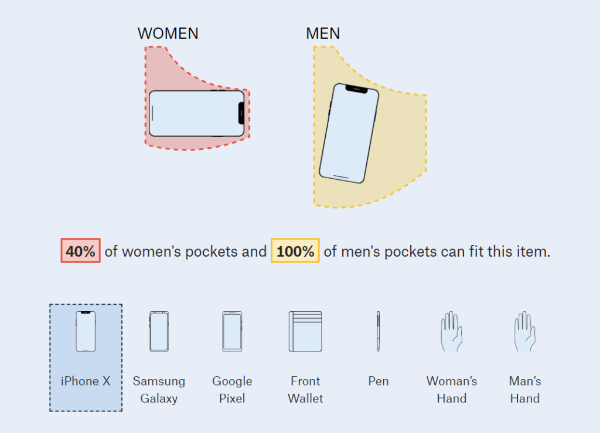 Only 40 percent of women’s front pockets can completely fit one of the three leading smartphone brands. Less than half of women’s front pockets can fit a wallet specifically designed to fit in front pockets. We spend hundreds of collective hours reading, studying and creating newsletters. To see a gallery of our favorites, and what makes them so good, go to TheEdge.Email. Each week we’ll recommend one of our favorites. When it comes to A.I. we like to think of ourselves as ‘well-versed’ (especially in relation to content), but are not of the illusion we’re a team of deep-learning PhDs. For the more academic, serious end of the spectrum, we highly recommend Jack Clark’s Import AI newsletter. Clark is the Comms Director for OpenAI, a nonprofit focused on the impact of AI on society, and more importantly, was a reporter at Bloomberg for a few years and can write. If you’re looking to dip your toes into more Arxiv hyperlinks, this is the place to start. The Wall Street Journal hits on one of the most important subjects of our time. 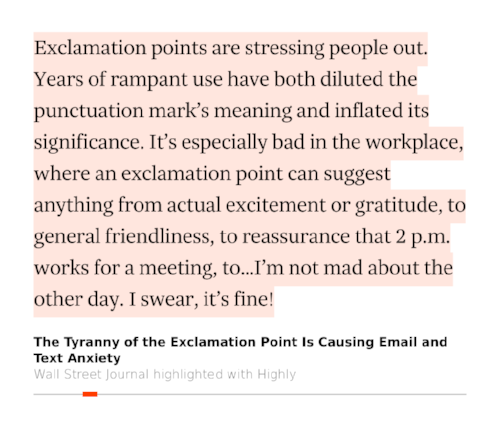 When should you use an exclamation point in professional life? Last week, we met the founder of a tool we love, Readwise. It helps aggregate, organize and deliver your Kindle Highlights (as well as other platforms like Instapaper) to help better retain information. If Twitter and Instagram are one end of the spectrum, with quick bursts of information instantly lost to the void, Readwise is the opposite end. It can surface knowledge from a book or article you read a decade ago. We discussed the idea of an information retention spectrum, where certain mediums contribute very differently to how you build knowledge. We threw out the term “slow reading”, until we realized there already is a movement of people who already try to…read slowly. While we try to better visualize this spectrum for a future blog post, we view newsletters as a crucial middle. They are ephemeral, but can act as reference points. They are conversational, but carry the weight of professionalism. They are digestible, but convey knowledge worth retaining.